The nuclear industry has been hugely subsidised. Nuclear power is currently more expensive than wind power in the UK and USA. The nuclear lobby distorts the picture, when comparing nuclear costs to those of other energy sources – by over-stating the likely performance, understating time to build and costs of nuclear. Costs of accidents and limited insurance are understated. The government bears the cost of waste disposal, and costs ofshutting down reactors are unpredictable. At the beginning of the nuclear fuel cycle – uranium mining As well as a dubious economic future, uranium mining leaves a costly legacy of cancers, and of environmental degradation. To be paid for by the tax-payer, of course. At the end of the nuclear cycle – radioactive wastes, an extremely costly legacy of radioactive waste, including the dead reactors themselves. Also to be paid for by the future’s tax-payers. Why then, is the nuclear lobby pushing for nuclear power? How to establish Australia’s “leadership” thoroughly in these industries? Well, it would be necessary for Australia to become a full player in the entire nuclear fuel ycle. So far, Australia has been aiming to be the leader in the “front end” – uranium mining. But people like Ron Walker and John White and others would like to make megabucks out of Australia taking in international nuclear wastes. And that’s not as far away as it might seem, seeing that Australia is signed up to the International Framework for Nuclear Energy Cooperation, by which Australia would LEASE uranium to other countries, and would take back their radioactive wastes. How to sell this idea to the Australian public? Well, the best way is to somehow convince Australians that we need a nuclear power industry. Then we’d have nuclear wastes of our own, anyway – so why not make a few people filthy rich by Australia taking other wastes too? If we’re going to stuff up aboriginal land, why not do the job properly, and make a lot of money for whiteys, and suitable bribes for some blacks? No doubt Australian nuclear enthusiasts, such as Ziggy Switkowski and Barry Brook, will claim that Obama’s decision vindicates their nuclear advocacy. But really it deviates from their version of reality so far as to shatter it. First, the cost is astronomical and requires endless government subsidy. On top of the construction subsidies there is an assumption of all liability and risks by government. Second, the reactors to be funded are not the Integral Fast (Breeder) Reactors that advocates claim will solve all the problems of nuclear power. The US cancelled its IFR research program 16 years ago. The new reactors will be standard thermal designs from the Japanese-owned Westinghouse. “Yesterday Professor Leslie Kemeny again urged that Australia construct five 1 gigawatt reactors . Based on current estimates, this would cost at least $A28 billion. Most likely, the cost will be much, much more because Australia would have to build nuclear infrastructure from scratch, and because “overnight costs” ignore the construction delays and safety issues that invariably arise — the reasons dozens of reactors have been begun and abandoned in the US and elsewhere in the past 30 years. The “front end”, the “central” and the “back end” The nuclear lobby has successfully confined discussion of nuclear power costs to the “central” cost of building nuclear reactors. Even anti-nuclear activists concentrate on this. 1. The Front end” – Uranium mining. – Who pays for the perpetual cleanup of radioactive tailings from uranium mining and milling? (e.g. uranium tailings mountain above) Who pays for the care of miners and community members afflicted by cancer from this radiation? How much money is lost to the community from the shortened work-life of these cancer victims, and of their family carers.? The loss of valuable land for agriculture? The loss of fresh water, now polluted? “Decommissioning” – i.e burying the body of the radioactive dead nuclear reactor. 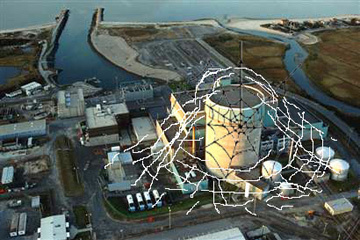 – As decommissioning expenses will be incurred long after the plant is established, decommissioning costs represent a future financial liability.“In France, decommissioning of Brennilis Nuclear Power Plant, a fairly small 70 MW power plant, already cost 480 million euros (20x the estimate costs) and is still pending after 20 years….n the UK, decommissioning of Windscale Advanced Cooled Reactor (WAGR), a 32 MW power plant, cost 117 million euros.In Germany, decommissioning of Niederaichbach nuclear power plant, a 100MW power plant, amounted to more than 90 million euros. Nuclear waste transport, disposal, and security. Even if no new reactors are built, getting rid of the country’s nuclear waste will cost $96.2 billion and require a major expansion of the planned Nevada waste dump beyond limits imposed by Congress, the Energy Department said Tuesday……….The $96.2 billion — in 2007 dollars not accounting for future inflation — includes $13.5 billion already spent on the Yucca project, $54.8 billion for construction and operation over 150 years and closing costs anticipated in 2113. 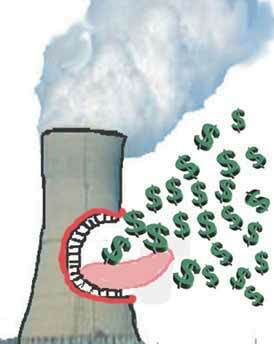 … Report: Nuclear waste disposal will cost US $96B – USATODAY.com 150 years! But who pays for the maintenance and security of those wastes for the next several thousand years? Security: Radioactive wastes must be kept secure – from accidents, natural events, terrorists. 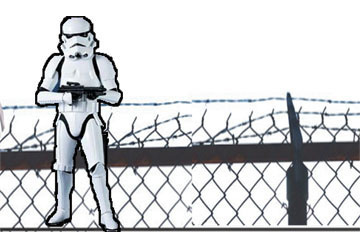 Who pays for this guarding of nuclear wastes over thousands of years?